Sicily ("Sicilia" in Italian and Sicilian), with an area of 25.426 km², is the largest island in the Mediterranean Sea. The coastline is 1.152 kilometres long. Along with surrounding minor islands, it constitutes one of the autonomous regions of the Italian Republic. 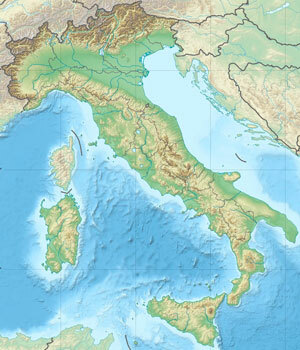 Sicily is located south-east of Italy's boot tip and is the remnant of a land bridge which once connected Europe and Africa. The most remarkable geographical feature of the island is Mount Etna, the largest active volcano in Europe. 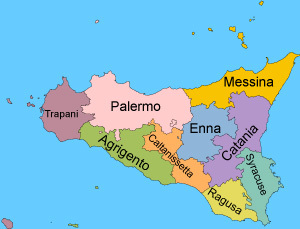 The largest cities are Palermo, Catania, Messina, and Syracuse. Palermo is also the capital of the autonomous region of Sicily. To have seen Italy without having seen Sicily is not to have seen Italy at all, for Sicily is the clue to everything. That said the most important german poet Johann Wolfgang von Goethe of Sicily. In Sicily, direction signs on motorways are green. There are four motorways in Sicily, connecting the major cities of the island. These are: the A18 Messina-Catania-Syracuse-Gela, linking the north-east to the south; the A19 Palermo-Enna-Catania, running inland to the east; the A20 Messina-Cefalù-Palermo, connecting the north-east to the north-west; and the A29 Palermo-Mazara del Vallo, which has also a branch to Trapani and connects the north-west to the south-west. Sicilian motorways are toll roads, with few exceptions near the main cities or in the south, where they are not complete yet. Always have some change handy (about 10 euros)! When entering the motorway, you must take a ticket (Biglietto). Don't lose it! Tolls must be paid in cash. Make sure you get into the right lane, marked with "Contanti" or a cash sign (on the left). There are also special "Telepass" lanes, which you can only use if you have a Telepass device. If you need a receipt, just ask for "Una ricevuta, per favore". State highways SS 113, SS 114 and SS 115 are also very important, as they run along the whole coast and compensate the necessary motorway links that are still missing in the south. Trenitalia trains connect Palermo to Messina, Agrigento, and Trapani, and Messina to Catania, Syracuse, and Agrigento. The Ferrovia Circumetnea, a local public transport company, operates the last narrow-gauge railway in Sicily (950 mm gauge), which runs from Catania and almost encircles Etna. Sicily is connected to mainland Italy by ferries, which depart from Palermo and Messina ports. After years of discussion, the long-planned construction of a bridge across the Strait of Messina was announced once again by Silvio Berlusconi in April 2008. The bridge was scheduled for completion in 2016. Since Berlusconi's resignation in 2011, though, it has been uncertain whether the bridge will be built. There are three international airports in Sicily: Palermo-Falcone e Borsellino Airport (formerly Punta Raisi Airport) in Palermo, Catania-Fontanarossa Airport in Catania, and the former military airport Vincenzo Florio, located 15 kilometres south of Trapani and operating as a civilian airport since 2009. From Palermo and Catania, it is also possible to fly to Lampedusa and Pantelleria islands. Comiso Airport, another former military airport located in Comiso (south-east Sicily), was converted into a civilian airport and opened in May 2013.